The 2018 Season Is Coming! The 2017/2018 snow year was a bad one for Central Colorado. Like real bad… But the spring storms are helping the snow hold in there a little longer. They are not going to make a difference in the long run though, as we’ll likely see an early melting snowpack this summer. I’m expecting the last few weeks of June to be in there as the snow will melt away much earlier then last winter. We’ll keep our eye on it and put up new posts as we start seeing significant changes. 2017/2018 is the bold blue’ish line wiggling around the green 2014/2015 line. You can see we are currently bouncing around this winters peak waiting for hot weather and runoff to start. However you can see how LOW that snowpack peak is. 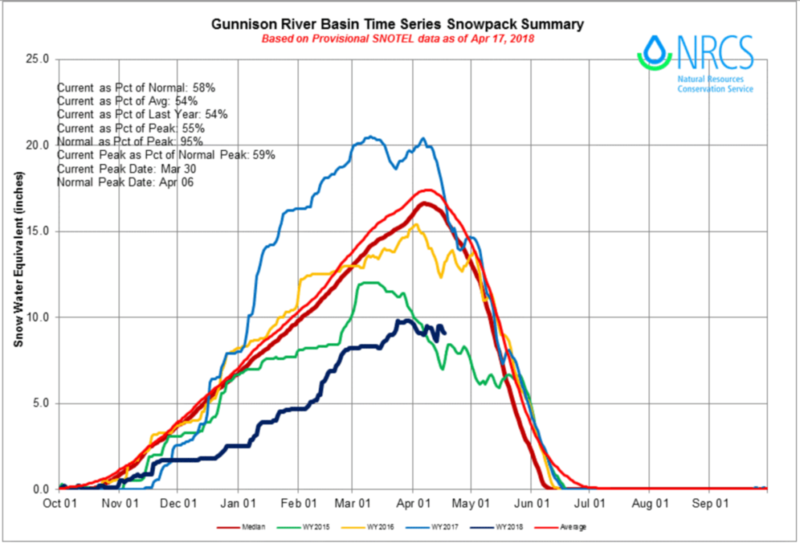 Far below the last few years and far far far below average peak snowpack. For reference, last summer had double the snowpack at this time!